& from Scotland including Hampton Fields. This album was released to the Japanese public in February 1969. The first Japanese release of this Stones masterpiece was the UK pressed export edition with the Japanese insert & flexi-disc. A rare find in itself, we now know there was a genuine Japanese pressing even before this..... and here it is! History states that since Decca refused to pass the controversial 'toilet’ cover the group wanted to use for Beggars Banquet, the album's release was delayed several times before being scheduled for December 1968. On December the 5th, the Stones offered a special press party at the Elizabethan Rooms in London, & the day after Beggars Banquet was in the shops with a plain white title cover. The album was released worldwide at the end of the year, but the Japanese had to wait until February '69 for their version. For unknown reasons, King Records did not press their own stock copies of the album. The Japanese buying public received a very limited UK export release. The labels were custom designed & manufactured in Britain, as was the sleeve. The labels do not read LONDON or DECCA and have the PS-539 catalog number (as US LONDON copies did). There is a 'deep groove' both sides, unlike the UK export 'ridge' around the middle. The matrix detail is printed on both label sides: XZAL 8477 (SDLBT 751) L / XZAL 8476 (SDLBT 750) L. If these matrices appear back to front, it's because, strangely enough, the sides are reversed. The album starts with ‘Street Fighting Man’ & is closed by ‘Jig-saw Puzzle’ [our Japanese buyer knows this extremely limited version dates to '20 February 1969' - part of King's promotional package were ultra rare flyers with this release date printed on them, not included here]. The record is housed inside one of the regular UK front laminated gatefold sleeves printed by Garrod & Lofthouse [no 'patents pending']. This part is a common find but for completeness sake, this cover grades VG+ with just some light shelf wear & mild foxing on the front, a common weathering effect with Japanese goods over time. The vinyl is Excellent to Near Mint with a lovely deep sheen both sides & only the lightest evidence of one or two plays in its lifetime. This is a vital piece of the Beggars Banquet 'jig-saw' & a remarkable find from our man in Japan. With only a small handful to ever hit the online market place, this is destined for one very serious Stones collection, indeed. 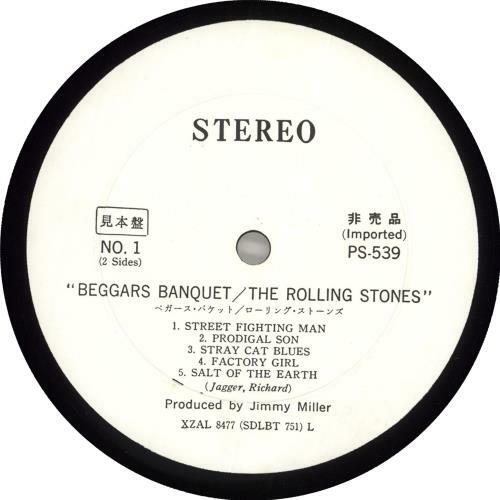 Product Information Rolling Stones Beggars Banquet Japan vinyl LP album (LP record) Promo.